Whisk egg white and water in small bowl until frothy. Working with 1 flower at a time, brush egg wash over entire surface of flower using a small paintbrush. Sprinkle both sides lightly with sugar. Place on baking sheet lined with parchment or waxed paper. Let stand overnight to dry. Flowers are completely dry when stiff and brittle. Store in single layers in airtight containers for up to 3 months. 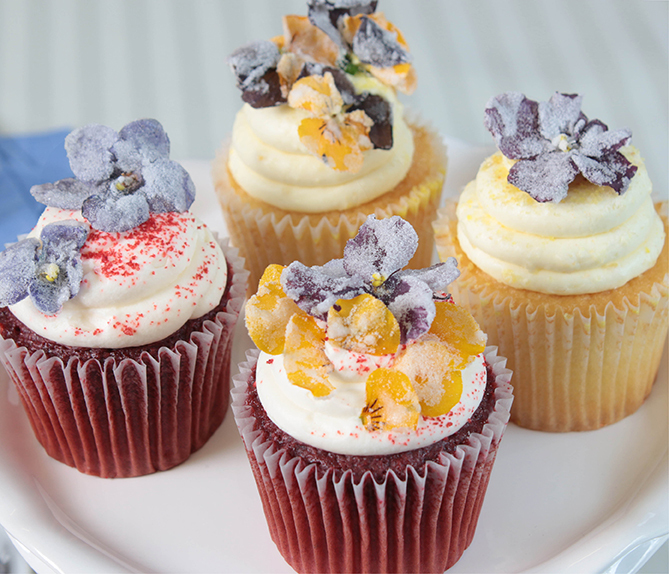 When ready to use arrange one or several flowers on top of each cupcake. Edible flowers include pansies, borage, rose petals, orchids, violets, geraniums and violas.